This tried and proven collecting method has been used for many years, and makes a great companion for the mercury vapor collecting light. 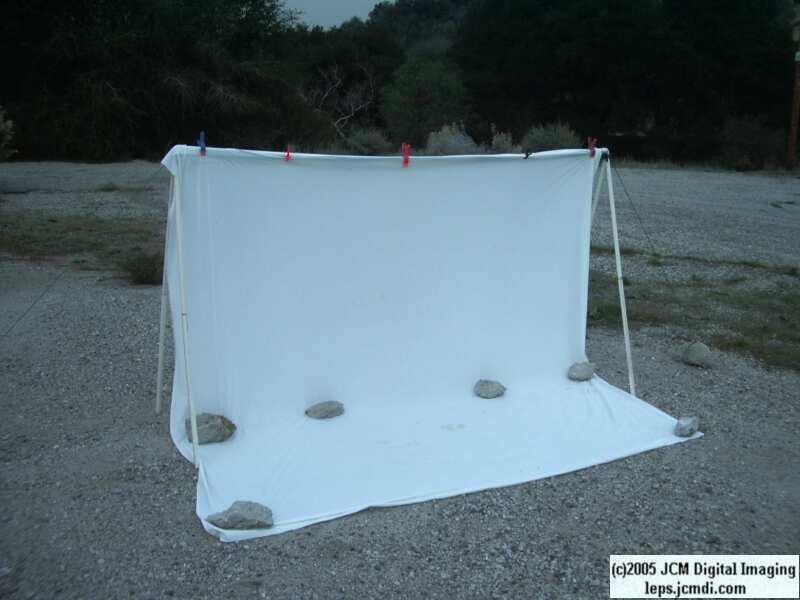 A collecting sheet acts as a reflective surface to increase light dispersion, gives insects a place to cling to when they arrive, and provides a convenient place to see and capture them. The goal of the project is to create a large, low-cost, reasonably strong and lightweight frame/sheet assembly, which can be broken-down into a compact bundle for easy transport and storage. You definitely won't be doing any chin-ups on this structure, but with proper setup and anchoring this rig should be able to withstand a light breeze, especially if set up parallel with the prevailing wind. Note that when constructed as shown, the finished assembly will stand about 7 feet tall, which could present a challenge for shorter builders/users. Using the fully-assembled structure is not recommended in windy conditions - it's basically a large sail! Fortunately, the sectional design allows the user to omit leg and cross-bar sections as needed to suit the user's comfort level and local conditions. The design can also be modified so that the cross-bar legs can be broken-down into more sections for smaller size and greater versatility. 50 feet (approx) of lightweight rope. 3 or more spring-type clamps. 40 feet (approx) of schedule 40, 3/4" o.d. PVC pipe. 10 feet (approx) of 1/2" o.d. PVC pipe. 2 (90 degree) elbow fittings for 3/4" pipe.